Emergency oxygen units are the first line of response for many diving injuries. Your unit failing while you are trying to render aid could have serious consequences for the injured diver. Regular equipment maintenance, while often overlooked, is as important as keeping your skills and training up to date. Regularly inspect your oxygen unit to make sure it will function when needed most. Inspecting an emergency oxygen unit is not difficult, but a few specific features need to be checked regularly for both your safety and the functionality of the unit. Thoroughly inspect your unit at least once a month and after every use. Make sure the cylinder is not just full, but full of oxygen, and that the oxygen washer is free of cracks, dirt, grease and oil. Perform a thorough inspection for leaks and signs of wear or damage, and make sure the unit is complete. Emergencies are stressful, and pieces of equipment commonly go missing after oxygen unit deployment. 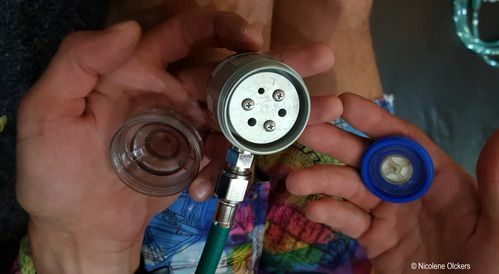 After each use, wipe down the cylinder, regulator and hoses, refill the cylinder, and replace any single-use items such as one-way valves, nonrebreather masks and bag valve masks. Oxygen units are very similar to scuba units: The cylinders require annual visual inspection and hydrostatic testing every five years, and the regulators require regular inspection and maintenance every other year. One important difference is that all equipment that will come in contact with pure oxygen must be carefully cleaned and, if required, lubricated with special oxygen-safe materials. Inappropriate lubricant selection, failure to adequately clean equipment, or exposure to any product containing hydrocarbons increases the risk of a unit starting a fire. Establishing a regular maintenance schedule and having a qualified technician inspect, clean and service the equipment every year mitigates this risk. Even strict adherence to these practices, however, cannot completely eliminate risk: Pure oxygen increases the risk of fire when combined with combustible materials and heat, so it is vital that you keep your equipment cool, clean and away from ignition sources.